JPMorgan Chase is one of the most recognized financial bodies not only in the U.S., but around the world. It’s pulled through tough economic times, including the recent recession and even the Great Depression, it’s survived typical bank scandals and was one of the stronger banks that managed to avoid the problems of 2008 that landed other big banks in hot water. With assets close to $2.3 trillion and an employment roster that easily tops 2000, there’s no denying the influence this banking giant has on global economic considerations. Late last year, news broke that Chase would be offering a co-branded card that has the new smart chip technology. This technology, of course, was designed to greatly reduce fraud. To get the program kick started, Chase and British Airways both ran heavy marketing campaigns here in the U.S., which is just what was needed considering the U.S. is slow to break the new technology in. It all centers around the expenses merchants incur in order to accept these newly designed credit cards. Still, it was one of those transitions that’s not optional – the smart technology is here to stay while leaving the antiquated strips in the dust. Since then, the Chase – British Airways card has taken off – partly due to the many perks and benefits. The beauty of this British Airways Visa Signature Card offer is found in a number of places – the security level, the impressive opportunities to earn mileage points and no transaction fees – just to name a few. Earn 100,000 BA miles with 50,000 awarded after your first transaction and an additional 50,000 after you’ve spent $2,500 and provided it’s during the first ninety days. Have a strong credit history? You might want to consider the Ink Bold with Ultimate Rewards if you do. One reason is the a $625 bonus towards airfare after you open an account and spend $10,000 in 3 months. You’ll enjoy a No Foreign Transaction Fee feature, too. Your $95 annual fee is waived the first year, too. . Some were concerned the Chase Slate Vertical would be overshadowed by the tried and truth Chase credit cards. Instead, it’s found a following of loyal consumers who appreciate all the perks and benefits with this credit card choice. You’ll see a $75 statement credit after you surpass $300 in your first three months and the 0% intro rate for fifteen months makes a good deal great. And did we mention you’ll never pay an annual fee with this Chase credit card? 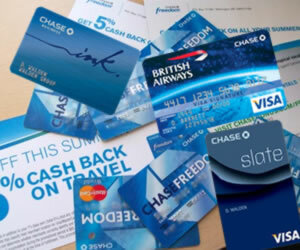 Still another one of the more popular products, Chase offers up its Freedom Visa. You’ll notice first the $100 cash back bonus after you make $500 in purchases during your first three months. Like all of the great credit cards, the rotating categories add to the savings bonanza. Not only that, but you get to select where those big savings go. You’re able to select three out of 15. These allow an additional 5% cash back. The cash back rewards never expire, there’s no annual fee and you’re always one phone call away from great customer service. Don’t forget Blueprint, the razor sharp budgeting tool that can whip your budget into shape in no time at all. This really is one of Chase’s strongest credit card offers. It’s jam-packed with great features, including 40,000 bonus points after spending $3,000 during the first ninety days; this comes to around $500 that you can apply on your travel plans – whether it’s airlines or hotels or rental cars. Not only that, but double points are awarded when you charge travel related expenses to your Chase Sapphire. Transfer your points easily to its partner programs – a few of those names include Ritz Carlton, Amtrak and even British Airways. Be ready to pay a $95 annual fee, however, for now, that’s waived the first year (though it could change in 2013). Your good credit ensures approval. Wondering just how versatile this credit card really is? Shop through the Ultimate Rewards Chase site and rack up the bonus points. With the holidays quickly approaching, the timing is perfect. Save big for everyone on your gift list. You’ll find plenty of Apple products, Microsoft as well as other globally recognized brands. Many folks wonder about the security of credit cards these days. Rest assured JPMorgan Chase takes advantage of every technological advance known to programmers and coders. They’re always a step ahead with around the clock account monitoring and a website that also incorporates the latest and greatest in technology and encryption. Every Chase credit card offer includes its zero liability protection. You can enroll in online bill payment, which provides a safe and easy method for paying monthly bills. Check your balances, conduct transactions and even make deposits with the Chase mobile app. Want account alerts? No problem – set it up on the Chase site for any number of alerts. As you can see, there is no shortage of great Chase credit card offers. From co-branded Chase offers to the Chase Freedom to Chase Slate, you’re bound to find a credit card that meets your needs and allows you to earn more than a few rewards in the process. We say it all the time – be sure to carefully review the terms and conditions. This is where you’ll find the details associated with any offer you’re considering. With the changes that came with the 2009 CARD Act, it’s important to understand how the new law affects you and your credit history. Not only that, but there are new rules that will affect not only the interest you pay, but potentially the way rewards points are issued. It’s just a good idea to carefully cover those bases ahead of time. Are you a Chase consumer? What are your thoughts regarding the many Chase credit card offers? Also, if you’re card holder of the co branded effort between Chase and British Airways, we want to hear about your experiences. Have you used the perks? Have you flown with British Airways in recent months?